Although Jimmy Kimmel typically films his show in Los Angeles, he was filming a week of shows in NYC when the prank took place. 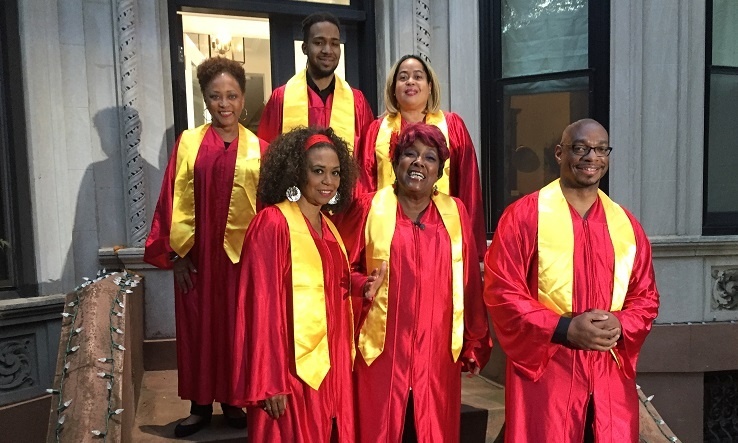 At his Airbnb in Brooklyn, John Krasinski arranged for a “Welcome Jimmy Kimmel, who is renting this house!” sign, along with a singing gospel choir (pictured above! ), inflatable decorations, a sign spinner, and a road construction sign inviting people to come in and say hello. (We've heard around 150 people we're waiting in line to say hi!). Members of the LSG Choir who participated in the prank included: Lynda K. Smith, Scipio Sargeant, Jr., Carolyn Jones, Deborah Sargeant, Lady Peachena, & Charles Carter. "The choir singing during the Krasinski prank video was the famed Late Show's Gospel Choir, formerly of CBS TV’s 'LATE SHOW WITH DAVID LETTERMAN.' Lady Peachena is the lead singer & founder of the choir which started on "THE LATE SHOW" at the request of Paul Shaffer, the show's former music director. When he told his then production assistant, Jill Leiderman, in October 1995, to ask Lady Peachena to form a Gospel choir to film a video for the show, she responded promptly with 20 singers the very next day. Lady Peachena dubbed them The Late Show's Gospel Choir, and they sang on the show for 10 years straight from 1995 to 2005. The choir’s voices have wowed audiences for years and they have performed on several other popular TV shows for the last 2 decades!" View the clip from Jimmy Kimmel Live here.